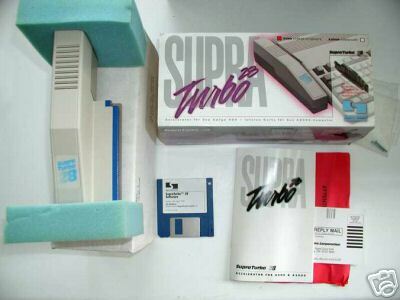 The Supra Turbo 28 was available in two forms but is essentially the same device. The first version was mounted in a case and is designed to be attached to the side expansion slot of the A500/+. It also included a pass-through for attaching additional devices. The second version is simply the motherboard supplied without the case and this is designed to be connected to the A2000 CPU Fast Slot. Note, this unit is not compatible with early German manufactured A2000's with "4-Layer PCBs". 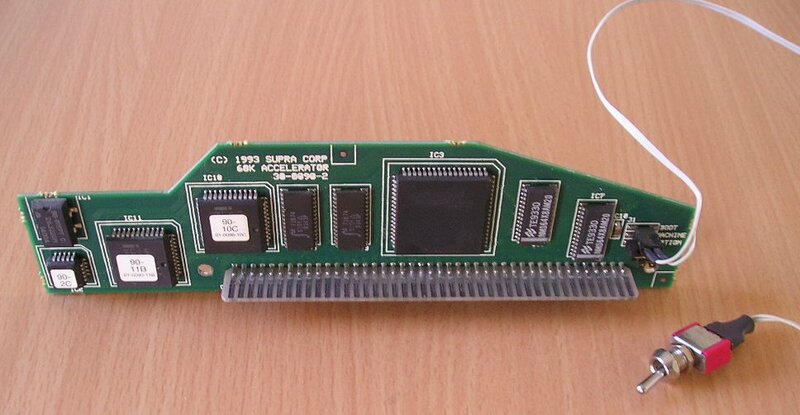 In theory it should be possible to remove the A500 version from the case and install it in an A2000, although removal of the A500 edge connector may be necessary. If you have more than 4MB of Fast RAM, removing this jumper will disable caching of the upper 4MB of the Amiga's auto-config memory space. This will avoid certain cases, for example with Bridgeboards which can corrupt the cache on the Supra Turbo 28. Similarly some GVP SCSI controllers fitted with onboard memory may lead to the corruption of the Supra Turbo 28's cache. The unit can be enabled or disabled in software, or by the use of a jumper/switch. The setting of the jumper/switch sets the initial state of the unit at power on which can of course be changed by the software afterwards. The A2000 version may not have the physical switch attached, like the A500 version. Page contributors: Allan Müller, Andrew Bowers, Andy Johnson, Dell Smith, Simon Vergauwen.